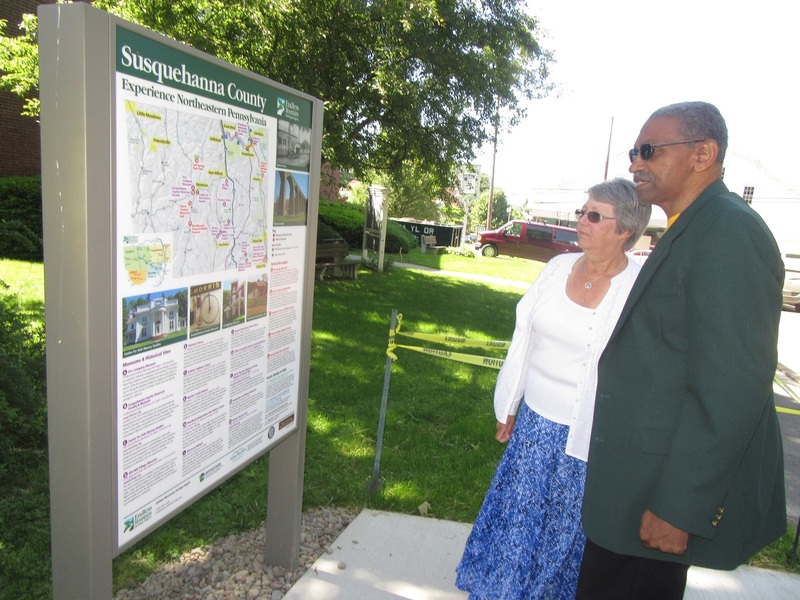 Cynthia and Sherman Wooden (top) of the Center for Anti-Slavery Studies in Montrose take in the new Susquehanna County Heritage Attractions sign recently installed on the grounds of the Susquehanna County Historical Society Museum. 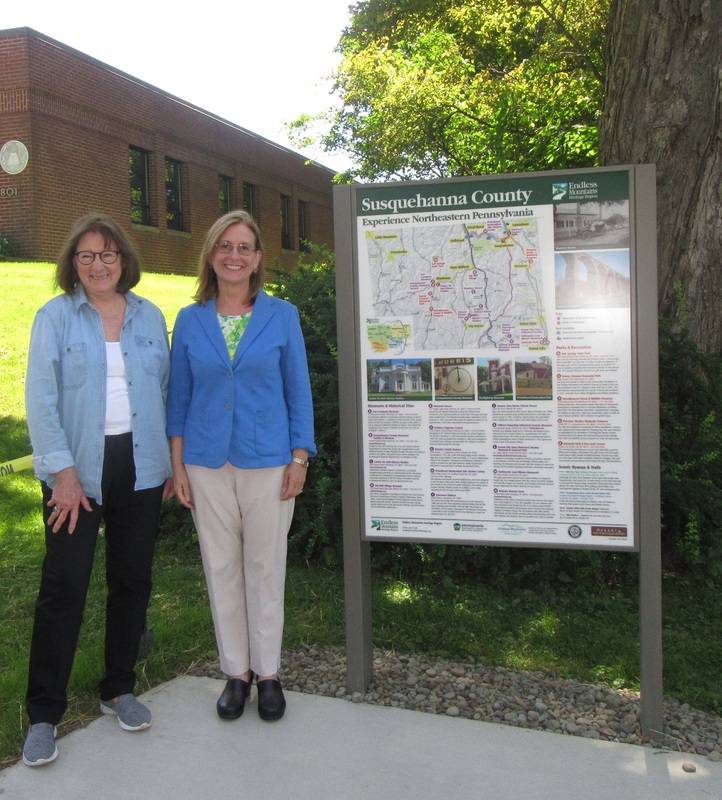 The new sign was officially unveiled on June 12 by Susquehanna County Historical Society Museum curator Betty Smith (above, left) and Endless Mountains Heritage Region director Annette Schultz. 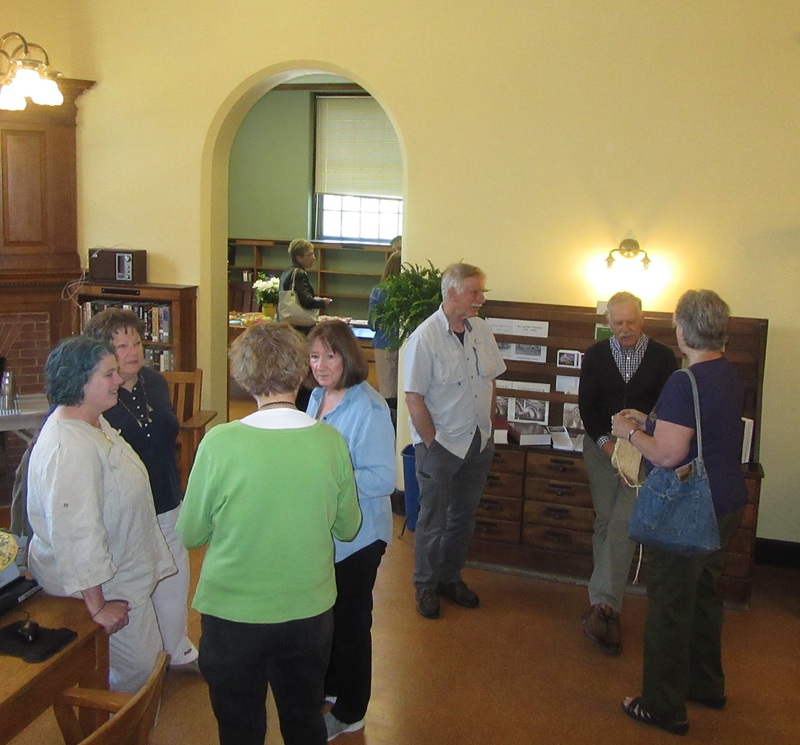 Local historians, stewards of heritage sites throughout Susquehanna County, and elected officials converged in Montrose on June 12 for the unveiling of a new sign across from Monument Square. 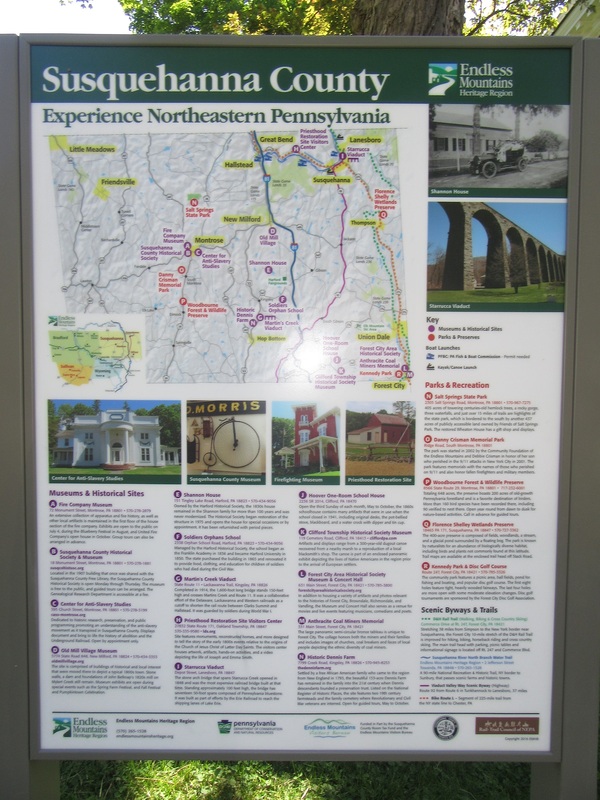 The Susquehanna County Heritage Attractions sign and map was installed recently on the lawn of the Susquehanna County Historical Society (SCHS) Museum, and is the second such sign procured for the county by the Endless Mountains Heritage Region (EMHR). The first was installed in Forest City in November 2016, and a third is slated for unveiling at Susquehanna Depot later this summer. 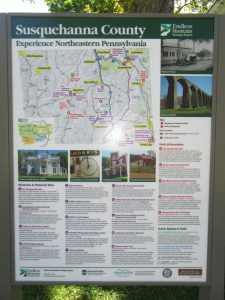 Attractions included on the sign include trails, nature preserves, historical venues, viaducts, memorials, and several museums. Each entry matches and icon on the map and includes location and contact information so people can call ahead to find out when the site is accessible. Some are open year-round, and others are by appointment only. Access points on the Susquehanna River North Branch Water Trail are also highlighted. The goal behind the signs, EMHR director Annette Schultz explained, is to help people understand both residents and visitors understand how much there is to see and do in the county, one of four in the Endless Mountains Heritage Region. “There’s surprises there I think for everyone, and we hope people will take advantage of it and mark it down where to go and what to do,” she remarked. The official dedication of the sign at Montrose coincides with the nearly completed renovation of the old Montrose Library building, which is now solely the property of SCHS. A reception was held in the museum after the unveiling ceremony, where Smith and other SCHS members showcased recent accomplishments. That could be because Susquehanna County played a larger role in the nation’s history than many people realize. A prime example is the county’s role in the Underground Railroad that provided a pathway for African American slaves from the south to find freedom in the north. “We are finding out, more and more, as we’ve gotten older about our history that we were not aware of,” said Sherman Wooden of the Center for Anti-Slavery Studies in Montrose. He and his wife, Cynthia, also attended the sign unveiling in Forest City. People are often equally surprised to learn that blacks who had been granted their freedom as early as the Revolutionary War found solace and built homes and businesses in Susquehanna County. The Dennis Farm near Kingsley, settled by Perkins/Dennis family in 1793, is a new addition to the sign. “When people come here, they will be able to see the sign and say, ‘We can go to a lot of places and be able to find the rich history of Susquehanna County,’” explained Lucas Taylor, Keystone College director of student activities and leadership development, who works closely with Dennis family descendants and conducts tours at the site. The county’s importance to the railroad industry is marked by its famous viaducts, and the beginnings of the Mormon faith can be explored at the Priesthood Restoration Site Visitors Center near Great Bend and Lanesboro. Similar signs have been funded and created by EMHR for Bradford and Wyoming counties and will eventually be developed for Sullivan County. Additional support for the project was provided by county room tax funds. To learn more about EMHR, follow Endless Mountains Heritage Region on Facebook.